As I dig my fingers into the soil this spring, I have been thinking a lot about the farmers who grow the coffee that ends up in our little roasting shack here on St. Joseph Island. I would love to be able to get together with a group of them, have a cup of coffee and discuss the finer points of gardening. We could talk about soil quality, companion planting, composting, sun, water, shade. Some day we’ll make that visit. Our ‘Big Max Experiment’ – a lesson in soil conditions. 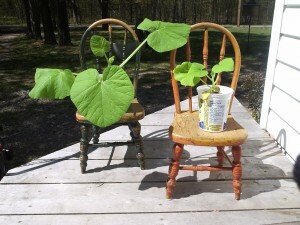 These pumpkin plants were started at the same time. After sprouting, the one on your left was moved to worm compost (from our red wigglers in the basement) and the one on the right was moved to a standard soil mix. We’re excited to see what they produce later in the summer/early fall. The work of the cooperative, in forging relationships with the farmers, can be exciting. So much so that co-founder Dean Cycon wrote a book about his adventures called “Javatrekker – Dispatches from the World of Fair Trade Coffee”. In one chapter, Cycon, who has spent more than 20 years working with the indigenous peoples of the world’s coffee growing areas, writes about forging a relationship with Peru’s Pangoa Co-operative. He first met General Manager Esperanza Dionisio Castillo at the Specialty Coffee Association of America (SCAA), a convention that takes place in a different U.S. city each year. For the farmer co-ops, it costs more than an annual wage to send a single member. But it’s worth the monetary risk because it is at this convention where the farmers can make important business connections in the developed world. For Dionisio, it was a chance to meet Cycon and tell him that although Pangoa had been Certified Organic and on the Fair Trade Registry for two years, they had not yet made a Fair Trade sale. Long story short Cycon committed to buying a container of their coffee (40,000 lbs!) and going to visit the co-op in Satipo, Peru. Cooperative Coffees has maintained a trade relationship withPangoa Cooperative ever since. Cycon helped them put together a marketing package and get more Fair Trade sales. By the end of 2005, nine of ten containers produced by Pangoa were sold Fair Trade. He also started a reforestation project. One of the many interesting tidbits of Cycon’s trip to Peru is his description of the big truck, full of coffee, getting across a rushing river via two big dugout canoes covered with planks. The truck drove onto the planks and the canoes’ motors revved full blast then drove the boats sideways across the river where this truck disembarked and continued on its way. Think about this the next time you’re enjoying a cup of our Peruvian Pangoa! Back on St. Joseph Island, I do feel closer to the coffee farmers while I’m in our own little family garden. We’ll continue our own experiments with organic growing and companion planting, learning something new each day.